I wish the video Outdoor Painting featuring James Fletcher-Watson, had started with the end, and ended with the beginning. For although the artist was quick to advise that painting in the open air should be done as much as possible, since "being in it creates spontaneity", what ensues does not live up to that promise until we reach the middle of the journey. In the beginning we are taken to the north coast of Norfolk to explore the art of "making a painting out of nothing at all", and then to the Lake District, which "has everything the artist needs." The contents sound interesting, yet like a supermarket sandwich, the package is bland and disappointing. I have the impression that this part of the video is aimed at the beginner and that, try as he might, James Fletcher-Watson's heart was not in it. His commentary was lacklustre, for he intoned, in the main, long lists of the colours he was using, like a high priest of the paint box. There was little else to enervate the spirit; few what fors, with what's, how's or when's. So much more could have been made of these nothing at alls. However, when we visit the Yorkshire Dales, that "wonderful painting country", the strong architectural features of Castle Bolton clearly interested the artist. With more enthusiasm he discussed the important features of the scene which create focus, the need for accents and foils in a composition, and how to achieve them, the fascination of tackling stone and the ways one can bring out texture and shape with colour and strong shadow. Enthusiasm is highly contagious and my absorption in this part of the video continued throughout Fletcher-Watson's final exposition of a scene at Hubberholme, with cottages and a stone bridge. In this painting he tackled the more complicated, crowded composition of stone, trees, rocks and water. The video concluded with a too brief summing up of the four paintings completed, during which the artist selected one as having "come off'. But he didn't tell us why! 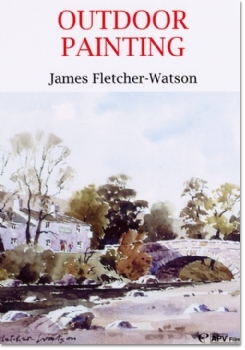 This video is not for the beginner, in the main, as James Fletcher-Watson advised; but for those who enjoy a matter of fact approach, landscape/architecture painting and the Yorkshire Dales, it should prove illuminating.
. .. of all the videos and books I enjoy, I number James Fletcher-Watson as primus inter pares. His latest video Outdoor Painting is beautifully done; the paintings in quite the best order, with simplest first; the explanation of the colours most helpful as usual, and the commentary by James a real pleasure and an encouragement to listen to. 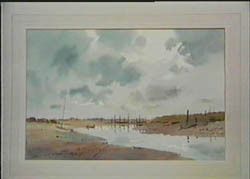 Betty Gingell in her critique, (April 1994) I felt, missed the point, especially about the Morston Quay picture. The subject was ideal to start with, as any painter from beginner to experienced would be undaunted by such a simple subject. Most people would probably overlook it as nothing worth trying and it was a marvellous object lesson in seeing what a lovely picture could result. It showed the importance of a big sky in Norfolk and the low horizon of mud and water with telling reflections of vertical posts. Surely a beautiful composition that inspires those of us who are learning. I'd hate readers to imagine this the dull old video Betty Gingell finds it. The demonstration by James in the April Leisure Painter shows his ability and for those of us who really admire his work, the video Outdoor Painting is a must. And you may certainly quote me on this as I feel it is important. Another fine demonstration video which concentrates on how to capture atmosphere and immediacy by painting on location is lames Fletcher-Watson's Outdoor Painting. 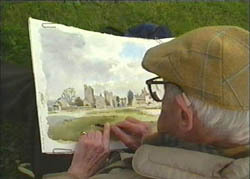 The versatility of watercolours is expressed though four contrasting demonstrations: a large-sky Norfolk landscape, a spectacular mountains and valleys view in the Lake District, an architecture-based subject at Castle Bolton, and, also in the Yorkshire Dales, Hubberholme Bridge, with its reflections and surrounding autumn trees.